This is an old piece of seersucker that I’ve had *forever*. Every couple of years I’d haul it out, thinking “surely there’s enough for THIS project” only to be sadly disappointed — until now. I didn’t do the self-bias trim on this version, since the fabric was so heavy and stiff — this is finished (by machine, even!) with plain ol’ white bias tape. This dress is great for biking to work; the skirt is easy to pedal in, and being sleeveless, it’s nice and cool on the bike, but I can cover up with a cardigan in the office. And it’s easy to dress down with sneakers, or make fancier with a belt and nicer shoes. I love the blue and white version. I’ve tried all over to find this pattern, or something like it, and failed miserably. Can you possibly help? 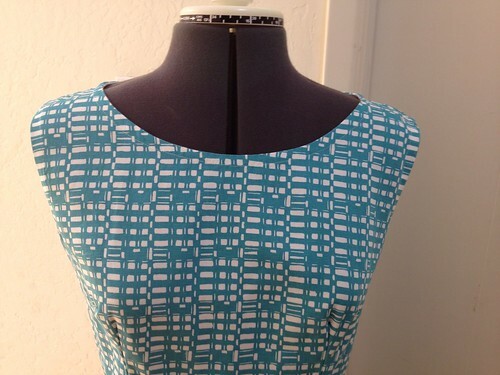 love Love LOVE both fabrics – can’t wait to see the rest (and to think that you got to use stash fabric, too)! Oh my I am so jealous, love, love this dress. Anything in seersucker is better than the same in another fabric. Great dress and how perfect that it uses such little fabric. Love the tennis shoes. That looks so cute on you, and the slightly shorter length of this one is perfect. You could even do this is a dressier fabric (like linen or eyelet) and it would go fancier places! These look fantastic on you. Thanks for the info about the Simplicity pattern. I should be able to get that in the UK so I reckon I’ll go for that – if I get around to making it it’ll be my first dressmaking for nearly 20 years! Erin, great looking dress in both fabrics. It is so flattering on you and you look great in it. 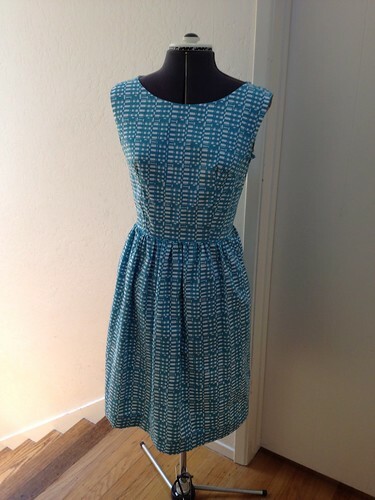 I like the real dress better than the pattern, it’s a very flattering cut. And I like the new shorter length. Win, Win, plus… stripes! 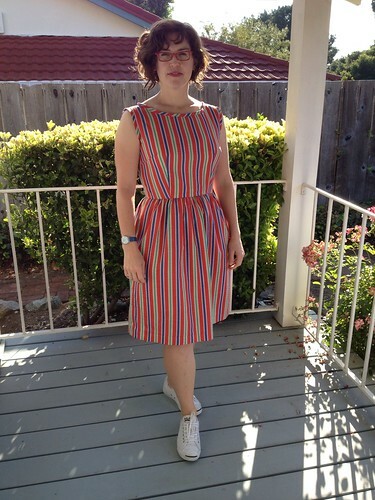 Both fantastic, love the neckline, and those stripes are wonderful, love how the self bias trim looks with the stripes! That dress is fantastic. Love the effective use of stripes. Stellar job – I can see why you bought these prints – they look terrific on you. Oh yeah! Loving the striped bias trim. I can see why this pattern has taken your fancy. Love both versions, but that turquoise and white fabric has me green with envy. So wonderful!